« 46th City Council District Video Debate! This Saturday is D-Day in Gerritsen Beach: Halloween! Halloween is usually trouble for any car, bus, city worker or delivery driver, and of course, any store front on Gerritsen Avenue. Gerrtisen Beach is so notoriously hazardous on Halloween that the MTA refuses to allow the B31 bus to continue past Ave U through the line of fire. It was fun to post about last yearâ€™s trick or treaters going door to door and unfortunately just as years past there was a good deal of mischief to report on. The 61st precinct did a good job last year but they could have reached the trouble spots much sooner. However it was a much more proactive approach than the year before, which was a disaster. Iâ€™m going to guess they will be equally proactive this year. If theyÂ aren’tÂ asÂ aggressiveÂ in preventing the â€œmischiefâ€, then Gerrtisen Avenue will continue to be a mess on Halloween. Last year they responded last year with the classic â€œIâ€™m your friend approach,â€ and would politely tell the kids to move on. Which they did, only to Victoriaâ€™s, but would start egging again as soon as the cops pulled away. 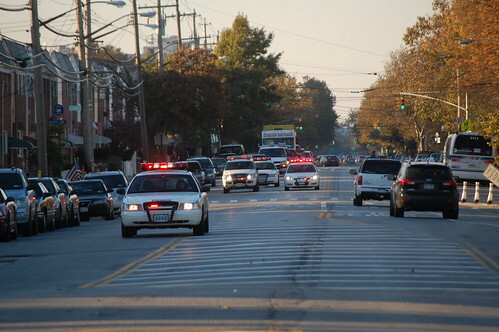 This year the precinct promised to keep a watchful eye on Gerritsen Beach. We will see if they live up to that and if our community lives up to their expectations. We plan on coveringÂ HalloweenÂ this year with multiple roving reporters with escorts. While others that have promised to send in pictures both the good and bad. Comment Policy: There will be no â€œoutingâ€ of anyone here, Â no names, ever. I say set up a high pressure water cannon truck to go up and down Gerritsen Avenue form 3 pm until 3 am. like we did in Alabama in 1962. Bull, we need you for mayor! @, kids aren’t protesting for civil rights yea narrow minded numbskull. What a horrible thing to write. How about bull for GBPOA Pres? lets find out who these people are and then put their parents in jail and make their parents pay for any property damage and advertise their names in the gerritsen beach news. SOME OF THESE KIDS ARE 18 YRS OLD AND THEIR PARENTS DON’T WANT TO CORRECT THEIR “CHILD”. THEY SAY,”HE’S 18 NOW SO I DON’T KNOW WHAT TO TELL YOU. I’M NOT RESPONSIBLE FOR HIM”. @, Parents are responsible until they are 21. Agreed. Their parent should play for any damages caused by their children. The kids in this area do not know anything about respect. It would be a shame if they needed to pay for what the do. There are stores with cameras now. so we need to follow up and post their pics and make them pay for damages. I hope one of those little shits eggs my car with my children in the car because after I drop them off at home I am going to come back and kick the crap out of every kid. Senator Golden has requested the cooperation and vigilant service of our local precinct and have contacted the bus operators’ command center, who are aware of the situation, and have agreed to maintain fluid participation from the MTA to keep the busses running as scheduled, barring any incident where a bus opperator or passengers’ safety is compromised. @Joan Byrnes, Why doesn’t Senator Golden request the cooperation and vigilant service of the parents of these kids? It is the parents responsibility. What is wrong with you people? Wake up, the precinct and MTA can only do so much. The parents of these kids will be the first ones saying the precinct and MTA were picking on their innocent kids. @bus shelter repairman, If we shot them all you’d be out of a job. @bus shelter repairman, Hey “bus shelter repairman” are you trying to get more overtime? Just why did you have to use the word “shoot” Huh? @Frank, Sign a waiver of what Frank, The US Constitution and The Bill of Rights? Well as i said probably far fetched but at least I am trying to rectify the problem by submitting ideas most people just complain. There is nothing unconstitutional about taking the eggs and shaving cream, and nothing wrong with identifying the kid or person. The next step is arrest , unless the community as a whole agrees on avoiding the arrest record so they may deal with it themselves and correcting the problem? This is how it used to be, see years ago you would rather go to jail then be brought home by the cops. We really just need the parents involved, everytime we get the precinct involved they just issue tons of summons to our cars for none sense. Someone I know got a summons for expired registration while the car was in his yard, behind a gate.